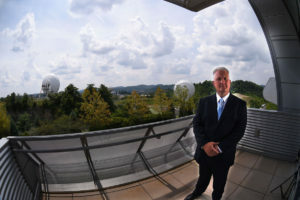 The observation may not be far off when comparing West Virginia’s two major technology parks, the I-79 Technology Park in Fairmont and the West Virginia Regional Technology Park in South Charleston. One was designed and built from the ground up to host high technology tenants, and the other is a repurposed research and development center adapted for new use after a major chemical company pulled out of the Kanawha Valley. The two facilities are as different as they are similar. While the Fairmont facility is geared largely toward high technology and the aerospace industry, the technology park in South Charleston is intended as a center for research and development and to help serve the chemical industry. Taking up about 400 acres in Marion County, the I-79 Technology Park was born in the early 1990s thanks to the foresight of then-U.S. Rep. Alan B. Mollohan and U.S. Sen. Robert C. Byrd. Recognizing the growing role technology would play in the future, Mollohan and Byrd helped steer federal funding and federal contracts toward a state-of-the-art technology facility furnished with the latest in infrastructure and support. The fledgling project got its first government tenant in 1993, when NASA opened its Independent Verification and Validation Facility at the park. Other government agencies would follow. James Estep, president and CEO of the High Technology Foundation that runs the park, said it is based largely on a “federal anchor model,” which assumes that government agencies that move into the technology park will attract spinoff industries and jobs. The Fairmont business park includes NASA and the National Oceanic and Atmospheric Administration, but is also part of a larger, regional approach to attracting federal anchors that includes the FBI’s Criminal Justice Information Services Division and the U.S. Army’s Biometrics Identity Management Activity in Clarksburg and the National Energy Technology Laboratory and National Institute for Occupational Safety and Health in Morgantown. Spinoffs from the federal anchor concept have so far included aerospace giant Northrop Grumman. In all, Estep said about two dozen companies have space in the technology park, including company headquarters for Mon Power, a subsidiary of FirstEnergy. The park is also home to Pierpont Community & Technical College’s Advanced Technology Center, an $18 million facility that opened in 2016. Estep said the technology park is about to begin the second phase of a four-phase construction plan, in part using funding from the federal abandoned mine reclamation fund. In comparison with the I-79 Technology Park, the West Virginia Regional Technology Park in South Charleston is located on the site of Union Carbide’s former research and development center. The 258-acre campus is home to 16 major buildings of more than 3,000 square feet and 32 smaller buildings. In all, the park has about 950,000 square feet of manufacturing facilities, laboratories, office space, educational and training space and a pilot plant available. Tenants on the site include the research and development group MATRIC, the Chemical Alliance Zone economic development group, chemical company W.R. Grace, polymer manufacturer Polyplexx, specialty leather company Morgan Rhea and TechConnectWV. The park’s newest tenant is N3, LLC, a Georgia-based sales and marketing firm that plans to hire about 300 people. The site is also home to the South Charleston campus of BridgeValley Community and Technical College. Technology park communications director Howard Swint referred questions about the facility to Dave Hendrickson, an attorney and chairman of the technology park’s board of directors. Funding for the two technology parks comes from different sources. Estep said about $200 million in federal and private monies went into development of the I-79 Technology Park, while the technology park in South Charleston is owned by the state of West Virginia. When Union Carbide and Dow pulled out of South Charleston, local and state officials were afraid the site would go to waste unless government stepped in to save it. Dow donated the property to the state in 2010. Since then, the state has put about $8.3 million into the technology park, according to the state auditor’s office. But without the state contribution, “It would be the largest flea market in the United States of America,” said Kanawha County Commission President Kent Carper. Ballard said it isn’t uncommon for state or local governments to subsidize technology parks. He said such projects aren’t always self-sustaining; governments choose to make the investments because of the potential jobs and taxes businesses that locate in the parks generate. According to the Columbus, Ohio-based Battelle Memorial Institute, the South Charleston technology park has an estimated annual economic impact of $626 million. A 2011 study conducted by Fairmont State University concluded that the technology industry in North Central West Virginia — which includes the I-79 Technology Park — had an economic impact of more than $1.6 billion. State funding for the facilities has also been contentious. While millions in state dollars have gone to the South Charleston park, the state had only been contributing about $200,000 a year to the facility in Fairmont. Estep said that was cut to nothing two years ago, largely due to the urging of state Sen. Roman Prezioso, D-Marion. Prezioso said it was nothing personal, but with tight state budgets something had to be cut. Prezioso said he doesn’t like the state putting money into the South Charleston facility either, but said state officials are committed. And while the South Charleston technology park will continue to require a state subsidy to survive, the Fairmont park has not been without its financial troubles. The High Technology Consortium recently had to file for Chapter 11 bankruptcy protection after officials for Huntington National Bank went to court over a loan taken out by the consortium. Estep said the loss of two major tenants at the technology park led to cash-flow problems, and bankers were unwilling to work with the consortium. He said he expects the tech park will be out of bankruptcy by the end of the year. Estep also thinks the two technology parks have different visions. “We’re following this economic model,” he said of the I-79 Technology Park. “South Charleston, on the other hand, is working to lease space at an older, less advanced facility and is forced to adopt a more “catch-as-catch-can strategy,” Estep said. “They have old buildings with no money to fix them up,” he said. In contrast, the I-79 park has new buildings and the latest in infrastructure support. Article originally posted by The State Journal, November 1, 2017.